Detective Hwang (Sol Kyung-Gu) leads a specialized surveillance team in the police department. Yoon-Joo (Han Hyo-Joo) takes a test to join the team. She's tested on her observation skills and memorization. She passes her test and becomes the newest member of the surveillance team. While, Yoon-Joo takes her test, James (Jung Woo-Sung) and his crime group robs a bank. He stands on the rooftop of a nearby building and directs his team's movements. He doesn't tolerate any mistakes. As soon as Yoon-Joo joins the surveillance team, they are tasked to take down James' criminal group. The surveillance team immediately runs into trouble when they can't identify any of the robbers due to their masks and their efficiency in robbing the bank. Detective Hwang finds one man caught on CCTV near the bank. James gets a new order from a mysterious broker (Kim Byung-Ok) and once again completes a heist. While, the surveillance team goes after James, the mysterious broker also looks to take out James. 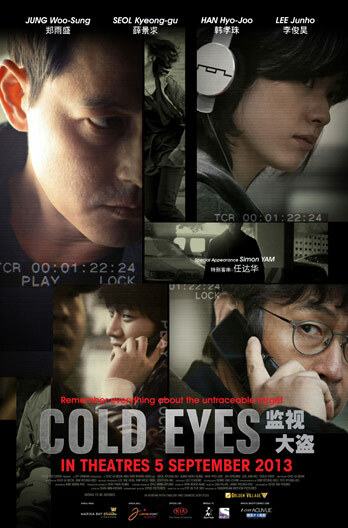 This summer the movie Cold Eyes is one of the hottest movie in Korea, topping the domestic box office charts in its first week of release on 3 July 2013 and earning more than US$36 million. The storyline is simple (just as the synopsis above says) yet intriguing (due to the way the characters are portrayed and the cinematography) as a specialized surveillance team in the police department try to catch their mysterious bank robbing organization, which turns out to be something more than they expected. Just as the movie begins, you are drawn into the plot as the all the characters start their day and their encounters actually intertwined. Although the characters all begin their day in the (same) subway station, there is enough suspense and wonderment in how all of it comes together. Yoon-Joo (Han Hyo-Joo) is someone who has impeccable memory about the details, which is what gets her accepted into the specialized surveillance team, since she passes Detective Hwang's (played by Sol Kyung-Gu) test. Unbeknownst to them, the robbery that occurs soon after is one that would change their lives (particularly Yoon-Joo's). Once accepted into the specialized surveillance team, Yoon-Joo meets Detective Daramjwi "Squirrel" (played by 2PM's Lee Junho - which I guess most fangirls would watch this movie for their favorite idol who plays a supporting role), who is the ace of the team and contributes to some of the humor and tears. Although there were alot of movements with the action scenes, the camera angles and editing were good and steady, flowing well with the action movements; not confusing at all and simply a delight to watch. There's even a cameo by Simon Yam (which was a nice surprise), who starred in 2012′s hit film The Thieves a.k.a 도둑들. Though the story centers mostly on Yoon-Joo and how Detective Hwang operate as a team with the other characters (in the zoo - curious to know what it means? Than you have to watch to movie, its simply hilarious! ), Jung Woo Sung as the bad guy totally stole the show. His portrayal of a cold, heartless mean machine might seem one dimensional, but as the movie progress you can see his character starting to crack yet putting on a force front. Overall, it may be simple in plot and some events might be predictable, but the execution and action made it an exciting enjoyable movie. Despite the grittiness and blood spilling, there are comical moments as well as heart-rending ones, making it an enjoyable emotional roller coaster of a movie!